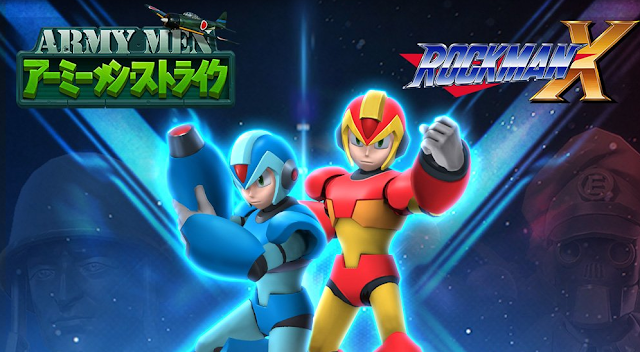 To commemorate Rockman X's 25th anniversary, Capcom have announced a totally random, yet interesting collaboration with mobile strategy game Army Men Strike. Starting today and lasting through December 14th, players can collect fragments to build a toy solider version of X. Once all pieces are found (or bought from the in-game store), you can recruit X as an officer to join you on the battlefield. A special, rare variant dubbed "Firewave X" can also be assembled. Although Army Men Strike is available in most regions, this collaboration has only been confirmed for Japan. I'll keep ya posted should anything change. I gotta be honest… I didn't even know they were still making those Army Men games. The concept seemed neat… and, I could definitely see a Mega Man X figure slipping into Sarge's ranks.